There are many varieties of rattlesnakes and sidewinders, and many of these venomous snakes are quite different from our common notion of what a rattlesnake looks like, based on the Western Diamondback Rattlesnake. If you wish to identify a particular specimen, it is advisable to consult a guide such as Amphibians and Reptiles of Western North America by Robert Stebbins. 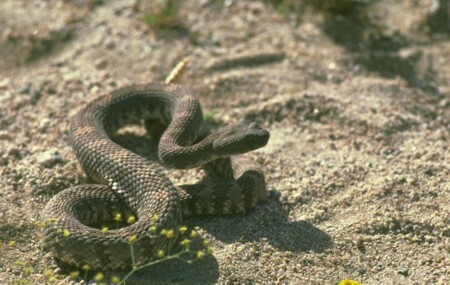 A number of these snakes are pictured in the Reptiles section of the Arizona Ecological Field Services Office Image Gallery of the U.S. Fish and Wildlife Service. Desert snakes do not make great pet snakes. The Arizona Mountain Kingsnake pictured above is one of the non-poisonous tri-colored snakes that resemble the coral snake, but a close examination reveals that the red and light bands are always separated by black bands. 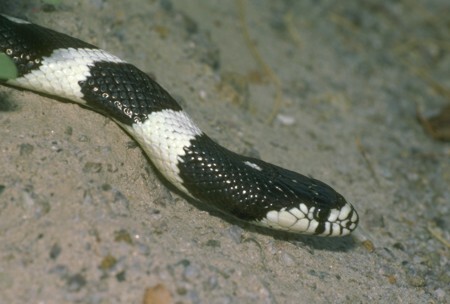 The Common Kingsnake (shown above) is black and white without red or yellow bands. The pattern may vary in crossbands, stripes, or speckles. This snake is common in the desert, mountain and shrublands and is active during the day through most of the year. Kingsnakes are not venomous but kill their prey by constriction. Their diet includes lizards, rodents, birds and other snakes. They are able to kill and eat poisonous snakes because they are immune to venom. The gopher snake shown above is one of the largest snakes in our range, reaching a length of as much as eight feet. These snakes are active during the day in cool weather and at night in warm weather. They are an asset in helping control rodents, since they consume a large number of them. When not hunting, they will hide under rocks or in animal burrows. Most of our other desert snakes are harmless, including the banded sand snake, the western shovel-nosed snake, the leaf-nosed snake, glossy snake, and the desert worm snake. 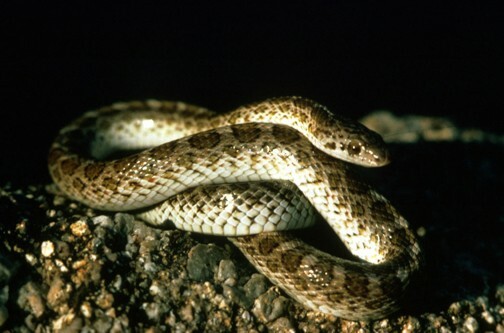 The glossy snake (Arizona elegans), shown above, ranges from 2 1/2 to 4 1/2 feet in length and is a gentle inhabitant of the mesquite deserts of the southwest. Its distinctive appearance is created by having smooth, glossy scales. 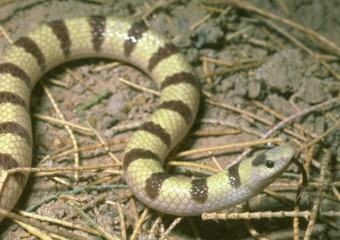 It is normally a burrowing snake, but can be seen crossing roads and other open spaces in early evening. It hunts for lizards or small mammals. There is also a snake found in eastern Arizona that swims in rivers and ponds, sometimes even in cattle watering tanks; this is the aquatic garter snake, which zips through the water feeding on tadpoles, frogs, toads and fish. Aquatic garter snakes may vary widely in size from 16 inches to 48 inches long. The babies are born alive. They are about 5 inches long at birth and are able to fend for themselves immediately. 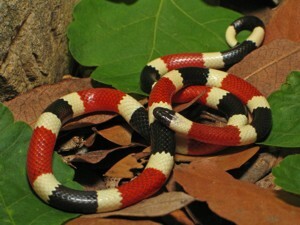 A very similar snake, called the Mexican garter snake, is widespread in Mexico and known in Spanish as culebra de agua. Snake bites can be extremely dangerous to household pets. The ASPCA offers the following tips to help keep your pet out of danger. Walk your pet on a leash. Tidy up your yard by clearing away undergrowth, toys and tools that make great hiding places for snakes. Clean up spilled food, fruit or bird seed, which can attract rodents—and therefore snakes—to your yard. A snake can strike from a distance equal to about half his body length, so if you see a snake, head back the way you came. If you think your pet has been bitten, keep him calm by limiting his activity. 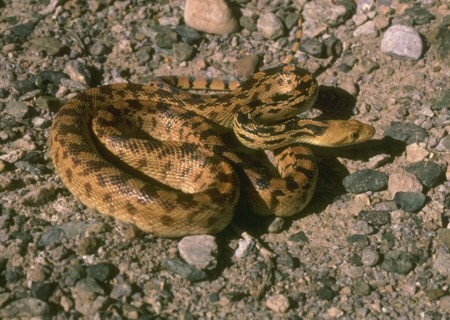 The Arizona Ecological Field Services Office has photos of many other local snakes. Click on the on the Reptiles link on the far right of the images page. Brennan, Thomas C. and Andrew T. Holycross. A Field Guide to Amphibians and Reptiles in Arizona. Phoenix: Arizona Game and Fish Department, 2006.